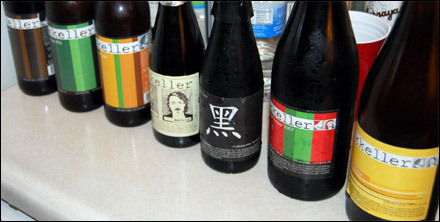 I've heard of Mikkeller on the Flossmoor Station blog and we saw it at Kahns the other night. The wine guy at Kahns that we talked to was very excited about Mikkeller. 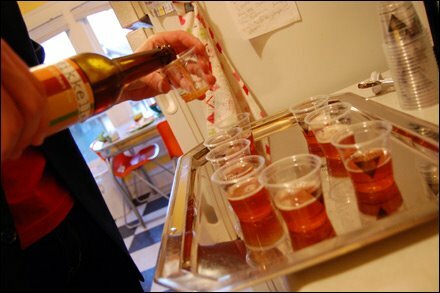 His enthusiasm coupled with these reviews makes the brewery a must-try in the future! When I hear a brewery like Three Floyds (who I admit I unfairly use as a punching bag) called "the best brewery in the world" and then we experience a ground of beers with as much depth and variety as these Mikkeller choices, I wonder about the experience of the folks voting. Then again, maybe my FFF's experience is limited. From looking at the Mikkeller site I see that we've missed at least five Mikkeller beers: Beer Geek Breakfast (a stout), Green Gold (an IPA), Monk's Brew (a quadruple), Black Hole (an imperial stout), and To From (a porter) - quite a few of which I know I've seen on the shelves at PartiPak on the southside of Indy. I suppose that's good news - I'd happily take part in a Mikkeller Marathon (Part II). I suppose we should have had one disclaimer - these beers aren't cheap. I think the most affordable choice was still more than $8 for 12 oz. I like the names of these beers! 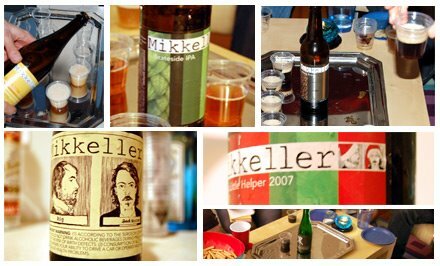 I've had most of these Mikkeller brews and I agree with the majority of the reviews. I think the Black needs some age on it though... I've also had Black Hole (think Black-lite) and To From (decent Baltic Porter). Thanks, Rodney. We actually tipped them off to let them know that we did a review of their stuff.